The go-ahead for women bishops was supposed to be the crowning achievement of Dr Rowan William's ten years as the Archbishop of Canterbury. Today, as the Church of England discussed where it goes after the General Synod voted against the measure, Dr Williams said it has "lost a measure of credibility" and had "some explaining to do". Anger is building in the Commons over the Church of England's decision on women bishops, but what action, if any, can be taken? The Bishop of Dover, the Rt Rev Trevor Willmott, said in a letter to the clergy and lay people of the Diocese of Canterbury that yesterday's General Synod vote "was not a 'no' to women bishops, but it was a 'no' to the proposed legislation as it stands". "I believe that the door to women being bishops is open and cannot now be shut", the Bishop wrote. "The clear majority of the Church of England demands it, the people of this country expect it, and I believe that the Holy Spirit yearns for it". "There will be women bishops in the Church of England and I hope and pray that the wait will not be a long one", he added. Shadow Home Secretary Yvette Cooper called the General Synod's decision not to allow the ordination of female bishops "deeply disappointing". 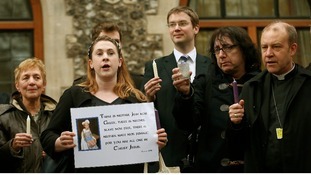 A vigil by supporters of women bishops was held on the steps of Church House today. Margaret Houston, a children's worker at a church in west London, said the vigil was organised last night on Twitter "by people who feel very strongly that they want to register their sadness over this decision". "We represent the majority who are in favour of women bishops", she added. The Rev Preb Pat Hawkins, a General Synod member from Wolverhampton, said she was "very sad" that the legislation was not approved. "I think we need to be clear that it was not the Church of England voting against the principle of women bishops, it was voting on a very particular measure", she added. Rachel Jepson, a lay member of the General Synod from Birmingham, said the defeat was "appalling" and "shameful". "I am quite disgusted, really", she added. The Prime Minister David Cameron has told the Commons, the time is right for women Bishops and the Church of England needs to "get with the programme". ITV News' Social Affairs Editor Penny Marshall says the Synod was left "shell-shocked" by the decision to reject women Bishops and the damage caused by the vote has been immense.